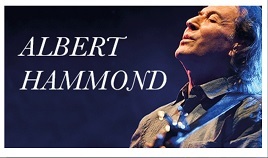 Legendary singer / songwriter, Albert Hammond, comes to The Royal Theatre, Castlebar on Saturday 10th October, for one memorable show! One of the all time greatest songwriters, his live performances are also tremendous! He´s joined on stage by his own band to present a stunning 2.5 hour journey through five decades of our lives. There was amazing reaction to Albert on The Late Late Show recently, when sitting on the couch beside Ryan Tubridy, with his acoustic guitar in hand, he stunned the audience, when he sang one massive hit after hit, which he has written down through the years. Other hits include ‘Down By The River', ‘One Moment In Time', ‘I'm A Train', ‘To all the girls I've loved before', ‘When I need You', and others too numerous to mention. He's even responsible for making our own Joe Dolan an international star! He penned ‘Make me an Island', ‘Good Lookin' Woman' and ‘Teresa' for Joe. "I loved Joe" He said. "After I wrote those songs for him, I moved to California. Joe was looking for more material to record. But nobody told me. That was a big regret of mine. Joe was an amazing talent and a wonderful person"
Albert has been writing hit songs for over 50 years. There has not been a single decade in which he has not written multiple hits songs since he scored his first hit with ‘Little Arrows' at the age of 24. That song was a Number One in the Irish Charts for The Dixies Showband and the Spanish version went on to top the charts in many Latin American Countries. His songs have been responsible for over 50 chart-topping hits. He has been inducted into The Songwriters ‘Hall of Fame' and has been awarded an OBE by Her Majesty Queen Elizabeth. The man is simply a living legend. Don't miss him in concert!